StickyNotePages allows groups of people to create notes, share their thoughts and ideas and edit them all at the same time. Everyone involved in a StickyNotePages session in Adobe Connect can add notes simultaneously. Notes appear on one of three pages (as selected by the note creator or editor) and collectively these pages are known as a Notepad. Later on in this guide you'll see how you are able to take the Notepad away from the StickyNotePages session, or bring a set of notes in with you! 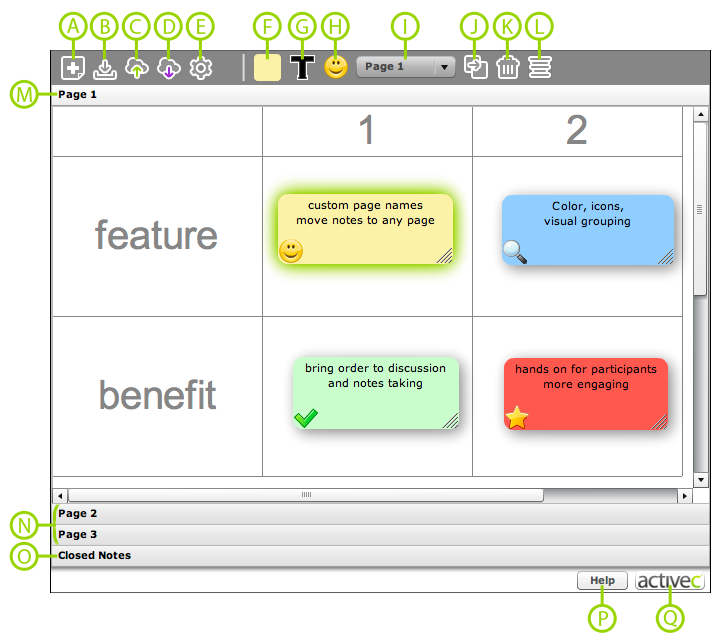 Here's a quick visual tour around the different buttons and key functions in StickyNotePages. The key buttons are located in the top left corner on the toolbar (A-D). Hosts will also see a button for the settings menu (E). To the right of the key buttons are the note editing buttons (F-L). Below you will see the page title (M), which defaults to page 1. The bottom left corner shows the other pages (N) - people can work on multiple pages at the same time. In the bottom right hand corner you will find the Help link (P), which brings you to this User Guide, and the ActiveC menu (Q), containing links to ActiveC's website, licensing information and version checker. Take a look around for information on creating, editing and closing notes, as well as Settings information for Hosts.